Edwin van der Sar OON (Dutch pronunciation: [ˈɛtʋɪn vɑn dɛr ˈsɑr]) (born 29 October 1970) is a former professional Dutch footballer who played as a goalkeeper. During his career he has played for Ajax, Juventus, Fulham and Manchester United. He is the most capped player in the Netherlands national team's history. He currently works as general director at Ajax. He came out of retirement to play for Dutch amateur team VV Noordwijk. On 12 March 2016, Van der Sar made a brief return to football to play 'one last game', for VV Noordwijk after first choice goalkeeper Mustafa Amezrine picked up an injury. Van der Sar saved a penalty in the match as they drew 1–1 with Jodan Boys. Van der Sar backstopped the Netherlands to the semi-finals of the 1998 FIFA World Cup, where they were eliminated by Brazil 4-2 on penalties after a 1-1 draw. In the third-place playoff, Netherlands lost to upstart Croatia 2-1. In the quarter-finals against Argentina, Van der Sar confronted Ariel Ortega after Ortega received a yellow card for a dive in the penalty area; the Argentine was then sent-off for headbutting Van der Sar. Shortly after Ortega's red card, Dennis Bergkamp scored the winning goal in Netherlands' 2-1 victory. Van der Sar started every game as the Netherlands won all three group games, including a 2-1 victory over reigning World Cup holders France, and beat Yugoslavia in the quarterfinals 6-1. In the semi-finals, despite the Italians going down to ten men and the Dutch being awarded two penalty kicks (which they failed to convert), regular play ended in a scoreless draw. Netherlands was eliminated by Italy 3-1 on penalties, with Van der Sar saving the spot kick of Italian captain Paolo Maldini, while his Italian counterpart Francesco Toldo made two saves in the penalty shootout (in addition to his penalty save in normal time) to carry the Italians to the final. Regarded as one of the greatest and most complete keepers in football history, Van der Sar was a large, athletic, yet slender goalkeeper, who excelled at handling crosses due to his height and physique; an intelligent goalkeeper, in addition to his reflexes and shot-stopping, he was also known for his calm composure, and his ability to organise his defence. However, Van der Sar was known in particular for his skill with the ball at his feet, as well as his accurate distribution with either foot, which gave him the ability to launch counter-attacks from his area with long balls. Due to his ability in possession, he also functioned as a "sweeper-keeper" on occasion throughout his career, in particular during his time with Ajax. On 3 August 2011, a testimonial was played at the Amsterdam Arena in honour of Van der Sar. The match featured the goalkeeper's "dream team", consisting of Wayne Rooney, John Heitinga, Louis Saha, Rio Ferdinand, Ryan Giggs, Paul Scholes, Nemanja Vidić, André Ooijer, Dirk Kuyt, Gary Neville, Michael Carrick, Edgar Davids, Giovanni van Bronckhorst, Boudewijn Zenden and Dennis Bergkamp with Alex Ferguson as manager. They faced the current Ajax first team, led by Frank de Boer. During the event, it was announced that Van der Sar would be working as an analyst for the Nederlandse Omroep Stichting covering the 2011–12 UEFA Champions League. Van der Sar's son, Joe, made written comments stating his father would be working as a goalkeeping coach at Ajax within five years. Van der Sar himself said he did not want to make a full commitment to this, but confirmed it was likely and he was interested in building up his coaching career slowly, starting at the lower levels. 1 2 "The best goalkeepers of all time". CNN. 9 February 2009. Retrieved 10 December 2015. 1 2 3 "Van der Sar ranks among the all-time greats". ESPN. 28 January 2011. Retrieved 10 December 2015. ↑ "Toldo, spunta l'Inter Il Milan prende Pirlo". la Repubblica (in Italian). 1 July 2001. Retrieved 1 May 2013. ↑ "Reports and Financial Statements at 30 June 2002" (PDF). Juventus F.C. 28 October 2002. Archived from the original (PDF) on 7 June 2015. Retrieved 10 May 2012. ↑ "Fulham land Dutch ace Van der Sar". BBC Sport. British Broadcasting Corporation. 1 August 2001. Retrieved 12 May 2011. 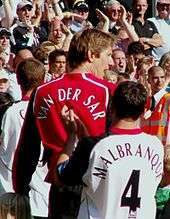 ↑ "Fulham unveil Van der Sar". BBC Sport. British Broadcasting Corporation. 2 August 2001. Retrieved 12 May 2011. ↑ "Man Utd floor Fulham". BBC Sport. British Broadcasting Corporation. 19 August 2001. Retrieved 12 May 2011. ↑ "Fulham 1-1 Aston Villa". BBC. 2 February 2005. Retrieved 8 September 2015. ↑ "The gossip column". BBC Sport. British Broadcasting Corporation. 21 November 2004. Retrieved 12 May 2011. ↑ Tynan, Gordon (27 January 2005). "Transfer tempted Van der Sar". The Independent. London: Independent Print Limited. Retrieved 12 May 2011. ↑ "Man Utd seal Van der Sar switch". BBC Sport. British Broadcasting Corporation. 10 June 2005. Retrieved 13 August 2008. ↑ "Edwin Van der Sar Bio". ESPN. Retrieved 13 August 2008. ↑ "Van der Sar pens new one-year deal at United". ESPNsoccernet. ESPN. 15 December 2006. Retrieved 20 July 2007. ↑ "Ronaldo secures PFA award double". BBC Sport. British Broadcasting Corporation. 22 April 2007. Retrieved 13 August 2008. ↑ Coppack, Nick (5 August 2007). "Report: Reds lift Community Shield". ManUtd.com. Manchester United. Retrieved 5 March 2009. 1 2 3 "Manchester United close to signing keeper – David Gill". BBC Sport. 15 May 2011. Retrieved 15 May 2011. ↑ "Van der Sar extends Man Utd deal". BBC Sport. British Broadcasting Corporation. 12 December 2008. Retrieved 12 December 2008. ↑ McNulty, Phil (31 January 2009). "Man Utd 5–0 Everton". BBC Sport. British Broadcasting Corporation. Retrieved 31 January 2009. ↑ Bostock, Adam (8 February 2009). "Edwin claims British record". ManUtd.com. Manchester United. Retrieved 5 March 2009. ↑ "IFFHS statistics – World Record of the national championships". International Federation of Football History & Statistics. Retrieved 5 March 2009. ↑ "Chilean Apertura 2005 semi-finals". LatinAmericanFootball.Com. Retrieved 5 March 2009. ↑ "United battle for points at Newcastle". EuroSport – Yahoo!. 4 March 2009. Retrieved 4 March 2009. ↑ "Giggs earns prestigious PFA award". BBC Sport. British Broadcasting Corporation. 26 April 2010. Retrieved 26 April 2010. ↑ "Man Utd suffer Van der Sar blow". BBC Sport. 5 August 2009. Retrieved 5 August 2009. ↑ Ornstein, David (17 October 2009). "Man Utd 2–1 Bolton". BBC Sport. British Broadcasting Corporation. Retrieved 17 October 2009. ↑ "Van der Sar returns after injury". BBC Sport. British Broadcasting Corporation. 6 October 2009. Retrieved 6 October 2009. ↑ "Man Utd 3–0 Burnley". BBC Sport. British Broadcasting Corporation. 16 January 2010. Retrieved 16 January 2010. ↑ "Manchester United's Edwin van der Sar extends contract". BBC Sport. British Broadcasting Corporation. 26 February 2010. Retrieved 26 February 2010. 1 2 "Manchester United's Edwin van der Sar to retire after this season". guardian.co.uk. London: The Guardian. 23 December 2010. Retrieved 25 December 2010. ↑ "Edwin on retirement". ManUtd.com. Manchester United. 28 May 2011. Retrieved 31 May 2011. ↑ "Van der Sar (45) gaat bij hoofdklasser Noordwijk keepen" (in Dutch). Algemeen Dagblad. 8 March 2016. Retrieved 9 March 2016. ↑ "Holland end Swede dream". BBC Sport. British Broadcasting Corporation. 26 June 2004. Retrieved 13 August 2008. ↑ "Portugal 2–1 Holland". BBC Sport. British Broadcasting Corporation. 20 June 2004. Retrieved 13 August 2008. ↑ "Van Der Sar Tight-Lipped on Future". Yahoo! Sport UK. 20 October 2007. Archived from the original on 22 October 2007. Retrieved 13 August 2008. ↑ Scurr, Andrew (29 October 2007). "Van der Sar to quit Holland". Sky Sports. Retrieved 29 January 2009. 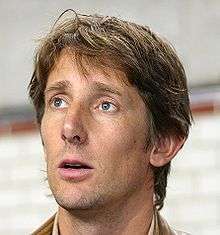 ↑ "Van der Sar happy to be Dutch daddy". fifa.com. 12 June 2008. ↑ Ruizenaar, Theo (22 June 2008). "Van der Sar ends Dutch career with painful defeat". Reuters. Retrieved 29 January 2009. ↑ "Edwin van der Sar most minutes played at European Championship". TopFootball.net. 21 June 2008. Retrieved 29 January 2009. ↑ "Van der Sar makes Dutch comeback for World Cup qualifiers". Reuters. 3 October 2008. Retrieved 28 October 2008. ↑ "Strikers put in the shade". FIFA. 15 October 2008. Retrieved 28 October 2008. 1 2 "Edwin van der Sar". BBC. Retrieved 10 December 2015. ↑ Daniel Taylor (28 May 2009). "Is Edwin van der Sar as accomplished as he would have us believe?". The Guardian. Retrieved 10 December 2015. ↑ "Buffon e Van der Sar maestri con i piedi" [Buffon and Van der Sar masters with their feet] (in Italian). La Gazzetta dello Sport. 14 March 2001. Retrieved 23 May 2014. 1 2 "Edwin van der Sar: Put your hopes in these hands for safe keeping". Independent.co.uk. London: The Independent. 22 February 2009. Retrieved 22 February 2009. ↑ "Van der Sar: A quiet hero". Manchester Evening News. 24 May 2008. Retrieved 13 August 2008. ↑ "Edwin given leave by United – Goalkeeper's wife in hospital after suffering brain haemorrhage". Sky Sports. 29 December 2009. Retrieved 30 December 2009. ↑ "Annemarie van Kesteren Pictures: Wife of Manchest United Soccer Star has Stroke". Newsbizarre. 29 December 2009. Retrieved 29 December 2009. ↑ "Manchester United goalkeeper Edwin van der Sar set for first team return after wife's collapse". Mail Online. London: Associated Newspapers. 4 January 2010. Retrieved 4 January 2010. ↑ "Edwin van der Sar". StretfordEnd.co.uk. Retrieved 24 October 2010. ↑ "Edwin van der Sar". National Football Teams. Retrieved 2011-09-23. 1 2 3 4 "E. van der Sar". Soccerway. Retrieved 10 December 2015. 1 2 3 "Man Utd's Edwin van der Sar to retire at end of season". BBC Sport. 27 January 2011. Retrieved 13 September 2016.